This patient came to our office seeking a functional and cosmetic solution. An inherited condition caused all of her permanent teeth to be either small or missing. Some of her baby teeth had never fallen out and required extraction. A life-changing functional and cosmetic result was achieved. Her remaining teeth that could be saved were supported with permanent restorations. This required a complete reconstruction using metal-ceramic bridgework. 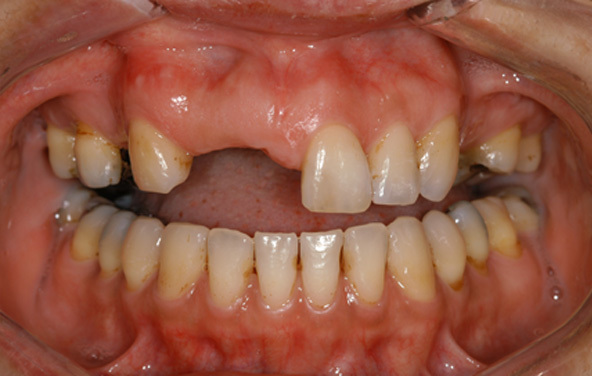 This patient was missing four upper front teeth. 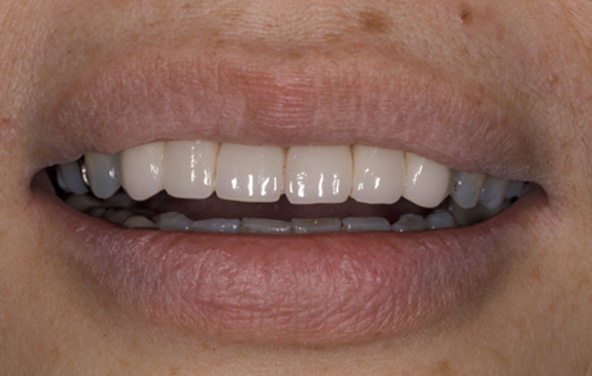 Her previously fabricated bridge had poor contours and did not offer good lip support, and her smile line did not appear natural. Her smile was given new vitality and luminance. 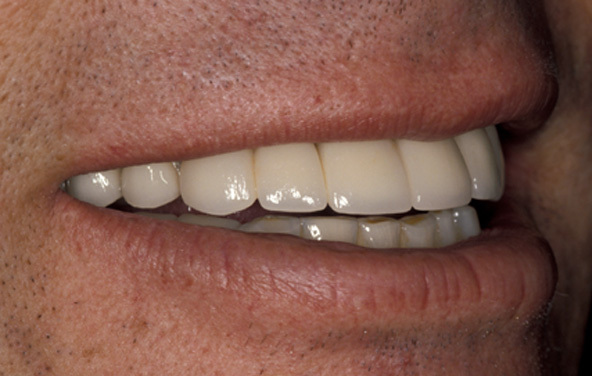 A new metal-ceramic bridge was fabricated, providing a natural smile line, better contours and better lip support. All of her other teeth required restorations to correct additional problems. 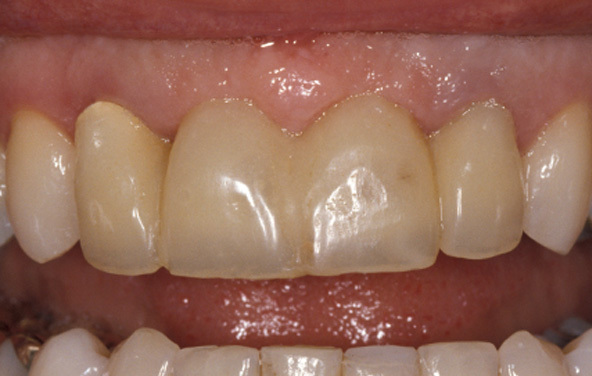 This patient had bridgework with an unnatural appearance. When viewed from the side, the teeth appeared to be tipped forward. The porcelain was dull, opaque, and lacked vitality. 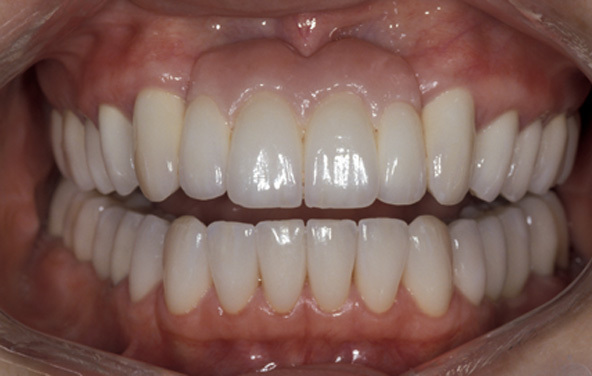 New bridgework was fabricated with better contours and alignment of the teeth. 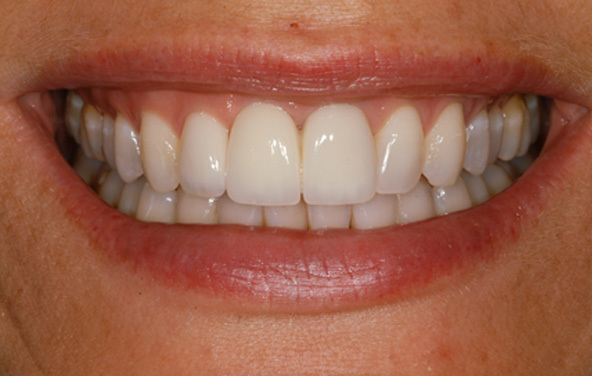 The porcelain was made brighter with more character and translucency just like a natural beautiful smile. This patient lost several teeth when she was growing up in the Philippines. 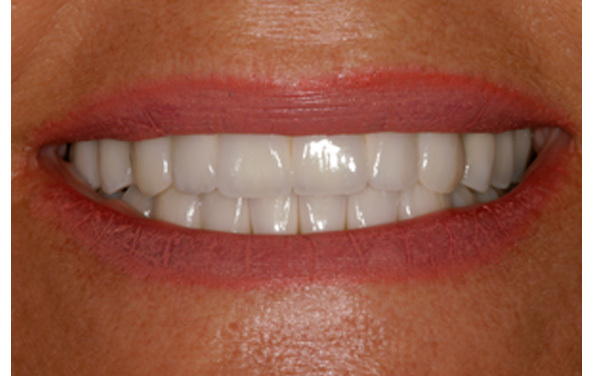 She wanted a pretty smile and to get rid of the removable partial denture that she had been wearing most of her life. This reconstruction required several phases. 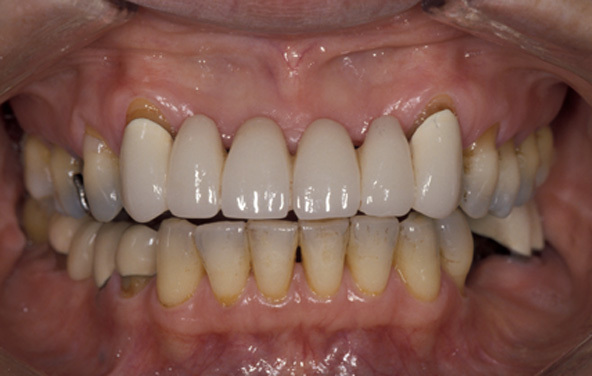 Following orthodontic treatment, dental implants were used to replace missing posterior teeth. 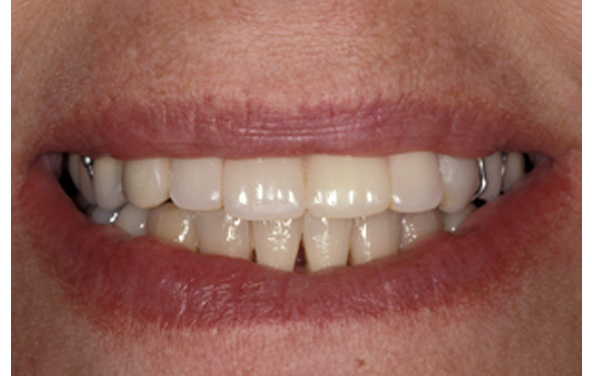 In the upper front area, her very thin bone made a porcelain bridge a better and more predictable choice than dental implants for that location. Porcelain crowns were placed on the other upper teeth. 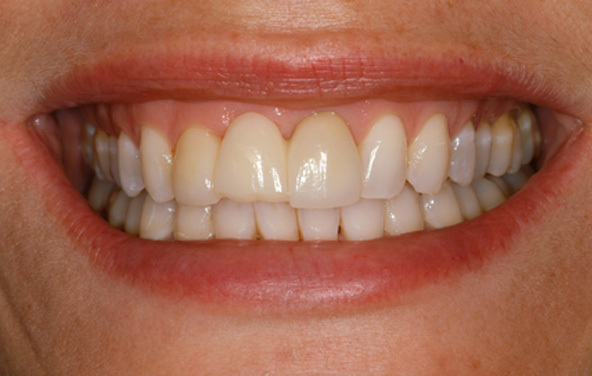 Our patient was overjoyed to be rid of her partial denture, and she loves her new smile. While in her 20s, this patient was involved in a car accident that resulted in loss of four front teeth along with much of the supporting bone. In addition, many of her other teeth were fractured in the accident. She was never happy with the difficult restoration that was completed by her previous dentists. Her referring dentist completed orthodontic treatment, bone grafting and implant placement. Then, we reconstructed her mouth using crowns on all teeth except the upper front. 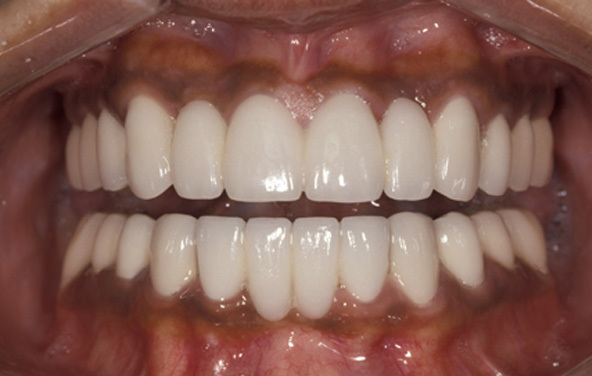 We used an implant supported bridge to replace the four front missing teeth. Pink porcelain was used in her bridge to restore the natural look and contours of lost gum and bone tissue. 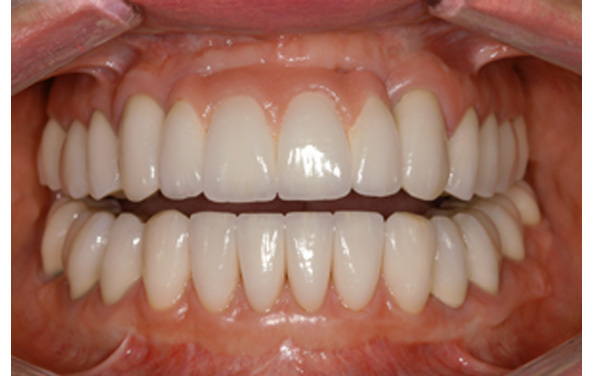 It also allowed us to shape normal sized front teeth and provided our patient with good lip support for a pretty smile. This successful business owner chipped the porcelain on her bridge. Even without the chip, she said she never really liked her current bridge. Her new bridge blends in much better with her natural teeth. She is very happy and thinks that our porcelain bridge is prettier and more natural-looking. A previous dentist, inexperienced with dental implants, placed an implant in the wrong angulation for this lateral incisor. 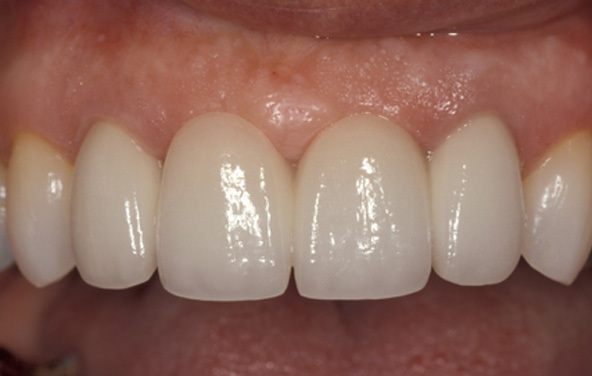 The incorrect position of the implant resulted in dark gum tissue and a crown with an unnatural shape. While we discussed various options with our patient, the chosen solution was to remove the failed implant and dark tissue. 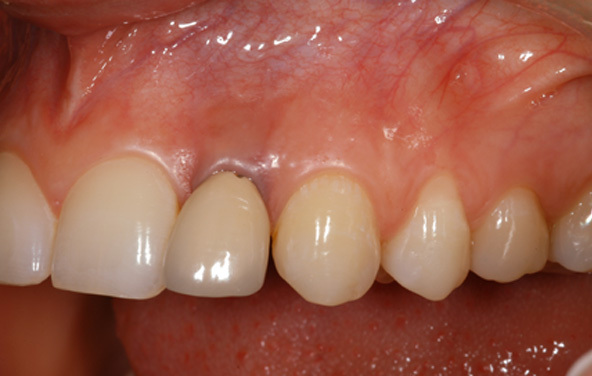 We performed a gum and bone graft, and then restored the missing tooth using a two-unit cantilever bridge. The supporting tooth is the cuspid. This option achieved an expedient and very attractive result. 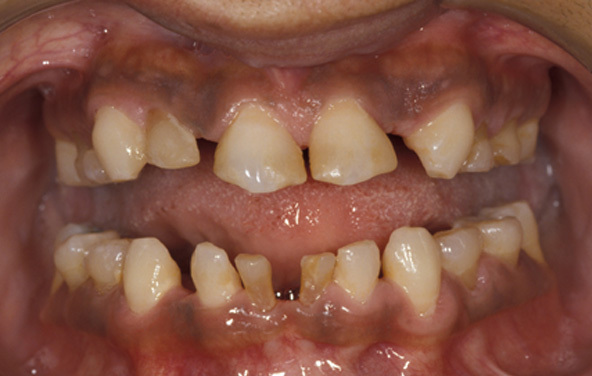 This patient completed her orthodontic treatment and needed to replace two missing front teeth. Her remaining teeth were discolored and many had failing restorations. 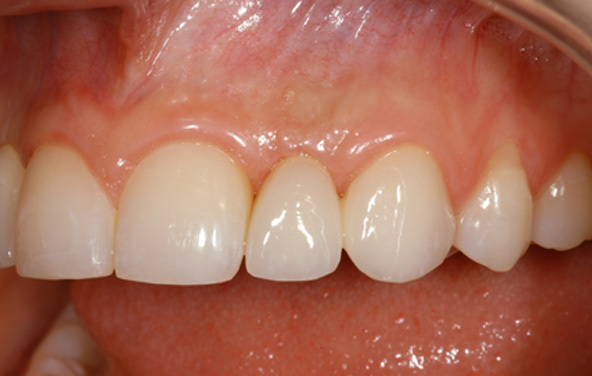 Wanting the fastest solution, our patient chose a dental bridge instead of dental implants to replace her front teeth. Crowns were also placed on the remaining teeth to build out a beautiful smile and a perfect bite. This patient's upper four front teeth were extracted when she was only 12 years old and living in the Philippines. 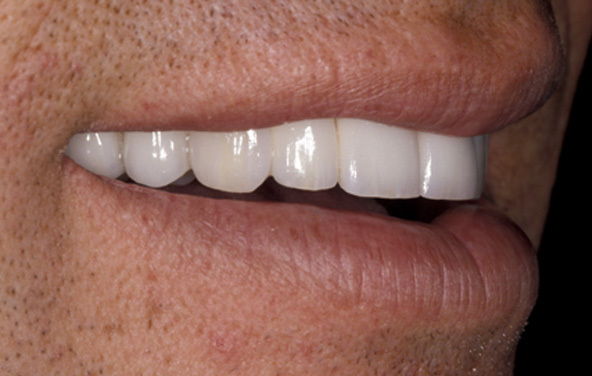 This is the typical appearance that occurs from the loss of front teeth and supporting bone. Her previous bridge had a reverse smile line and did not provide adequate lip support. 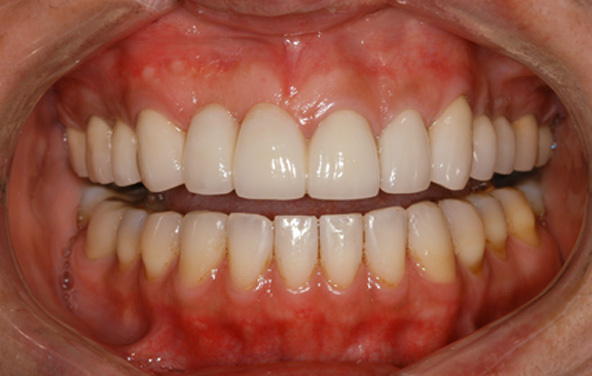 A new bridge provided better lip and facial support, and pink porcelain replaced the lost gum and bone tissue. 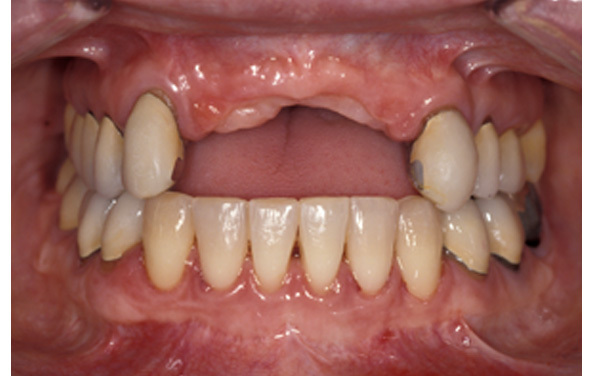 Dental implants would not have been a predictable option to replace her front teeth because of the extensive bone loss. 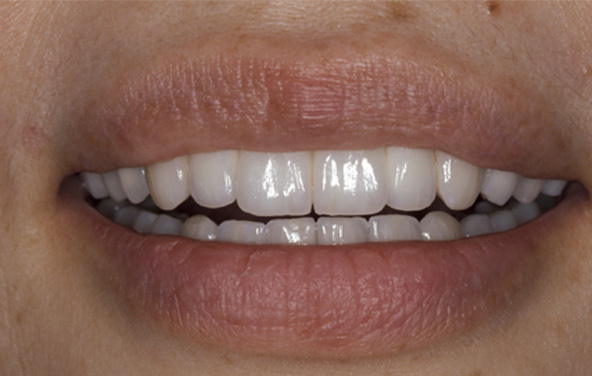 Implants and crowns were used to restore the rest of her mouth. Her new smile is very natural in appearance and function. Structure and appearance were both serious issues. 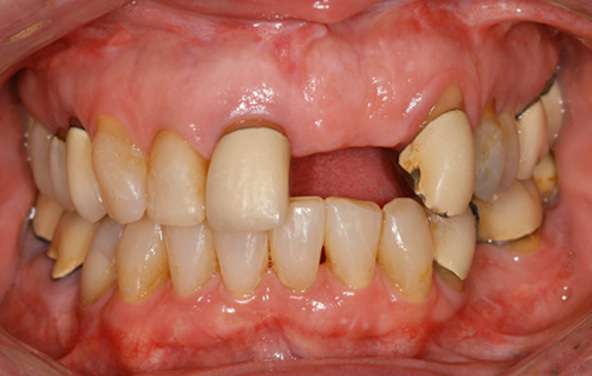 This patient was missing two of her upper front teeth. A four-unit temporary bridge had been fabricated by another dentist before she transferred to our office. All of her teeth had yellowed. A beautiful and life-like result. 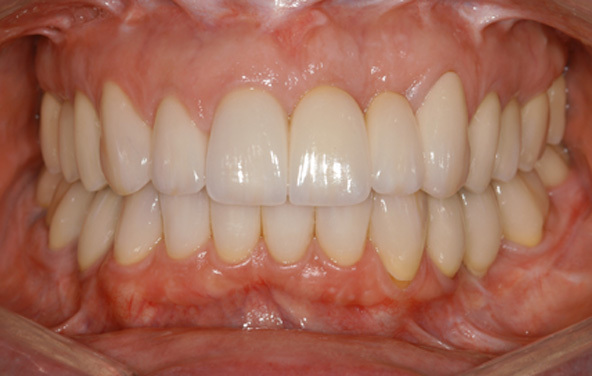 All teeth were cleaned and whitened before a metal-ceramic bridge was fabricated. Porcelain margins were used to avoid any shadows at the gum lines.